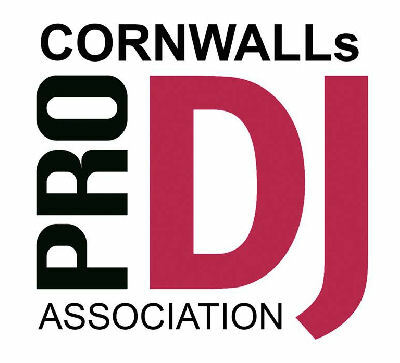 With SoundONE mobile disco being at the forefront with modern technology, not only do we have one of the best systems in Cornwall, we are one of the very few DJ's in Cornwall offering a complete VIDEO DISCO service alongside a fantastic lightshow. For large events we can bring up to 4 LCD screens and a projector. We use 2 x 32" LCD screens and 2 x 19" LCD screens to display videos to the majority of tracks played and if a suitable wall is available we can also use a projector to display music videos 6 - 8ft in size. Having music videos to accompany the music being played gives your party the edge and creates a fantasic atmosphere, why settle for less when you can have the best? We have a large collection of official music videos, many of them very high quality in a format known as 1080p. But as 1080p is HD (high definition) and this format has only been around for a few years, only the latest music videos will be in this format. Older videos that were made during the late 70's to 90's were mostly filmed on video tape and often the quality of the early 70, 80's video were generally filmed in a format known as VHS which is roughly equivalent to 333x480 pixels luma, 1/6 of a MegaPixel. Later on video was filmed in S-VHS and Hi8 in the format 560x480 pixels then came standard DVD format 480i and now we have 720 and 1080p the latest high definition formats as standard. You really don't need to worry about the various different formats, it just basically means that music videos of yesteryear are not of the same quality of music videos made today, also a lot of music made in the 70's to early 90's would have never have had a video made, unlike almost every hit made today it would be unthinkable for it not to have an HD video to accompany it. Our video screens can also be used to display any images you wish to supply as a slideshow, or we can do a mixture of images, video effects and music videos. They can even be used to display the words for Karaoke. 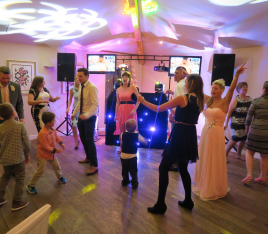 What party is best suited to the video disco add-on, the answer to this is quite simply every party and even more so if you want the WOW factor. 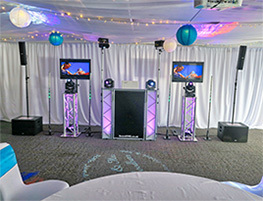 The video screens can be great for the type of people who love to go to parties but don't like to be on the dance floor themselves. They love to watch the other guests dancing and chat with friends but may not have the confidence to get up and dance. The video screens just enhance the entertainment especially for this type of guest. As some videos contain material that may not be deemed suitable for young children we will not show videos to these songs if children are present. We can replace the video with video effects of pictures that are family friendly. Some of the videos are also short films in themselves and can be very good to watch especially during meals and buffet times. Certain videos show complete dance routines, which bring some great enjoyment to the dance floor especially to anyone who is not familiar with some of the popular classics like Michael Jackson's Thriller, The Cha Cha Slide and YMCA for example. Long gone are the days of the 70's disco system comprising of a few coloured flashing box lights, although some so called discos still look like they're using the same equipment they were in the 70's, but then again my grandfather still has a gramophone. SoundONE brings disco into the noughties, a disco system without video today is like a disco without box lights in the 70's. 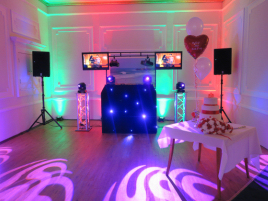 Why book a tired and out dated DJ when you can have a cutting edge DJ with state of the art Video, Sound and lighting effects. Here you can see an example of our music video screens in action, being use at the Eden Project in The Gallery we have numerous configurations and setups we are able to do. 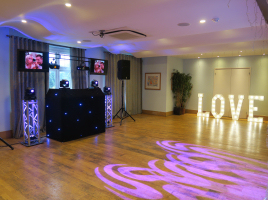 At this party our screens were used to show music videos, however many of the guests were deaf, so the screens were used to show the words that the were signed as well as show the mmusic video to the track for all the guests to help enhance there enjoyment on the day. 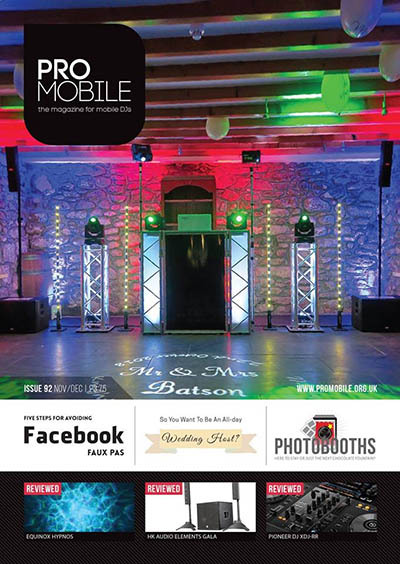 SoundONE featured on the front cover of Pro Mobile Magazine and inside on the feature pages, we were in Nov/Dec issue 92. 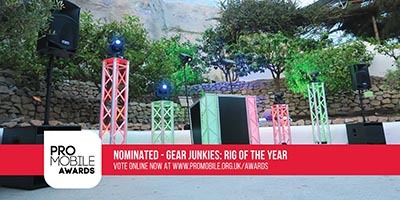 We are one of just 6 DJs in the country, to be nominated for the Pro mobile DJ rig of the year award. 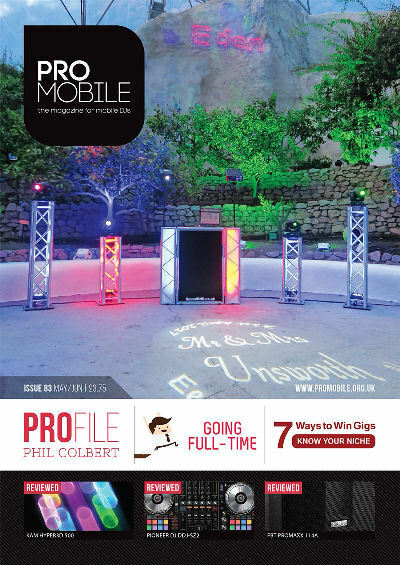 SoundONE featured on the front cover of Pro Mobile Magazine and inside on the feature pages, we were in May/June issue 83. 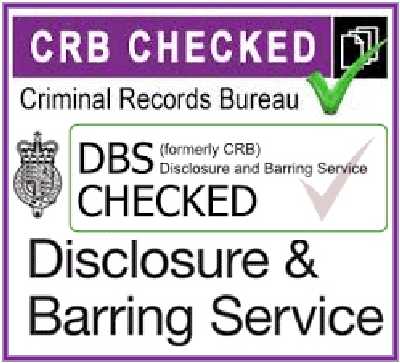 Areas we cover as default: Camborne - Redruth - Hayle - St Ives - Helston - Penzance - Falmouth - Truro - Newquay - St Austell - Marazion - The Lizard - St Just - St Buryan - St Agnes - Sennen - Padstow - Porthtowan - Porthleven - Perranporth - Penryn - Newlyn - Mullion - Liskeard - St Mawes - Bodmin - Lostwithiel - Looe - Mevagissey - Fowey - Launceston - Wadebridge - Tintagel - Saltash - Torpoint - Lands end to Plymouth, Cornwall and the South West.